(Zeus)King of Gods and Pluto(Hades) Devil God or King of Underworld. In Greek he was called Poseiden God of Fresh water. 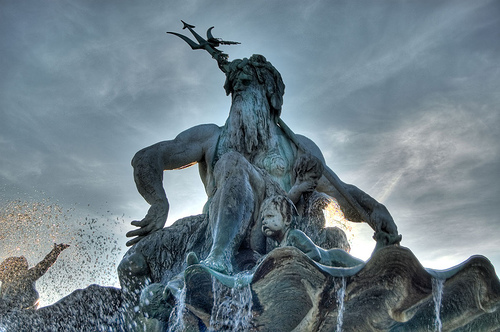 Neptune had the reputation for having a violent temper. Tempests and earthquakes were a reflection of his furious rage. He was depicted as a bearded man holding a trident and seated in a seashell drawn by sea-horses. Neptune is the eighth and furthest planet from the sun. Neptune’s atmosphere gives it a blue colour which is fitting with it being named after the Roman god of the sea. 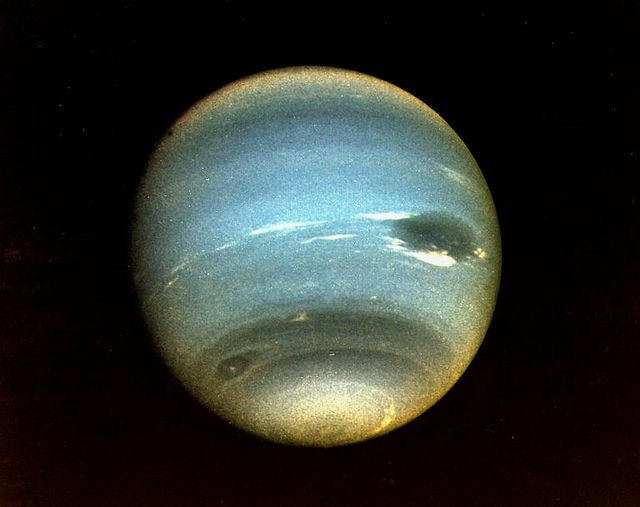 Neptune is an ice giant gas planet. Moons: 14 (and growing Tritons), Rings- 05, Mass: 17 times the mass of Earth, Diameter: 30,775 miles, Year: 164 Earth years, Day: 16.1 hours, Temperature: -235 degrees F, 30.10 AU from Earth. Neptune is a little bit larger in mass than Uranus making it the 3rd largest planet by mass. In 1989, the Voyager 2 spacecraft swept past the planet. It returned the first close-up images of the Neptune system. The NASA/ESA Hubble Space Telescope has also studied this planet, as have a number of ground-based telescopes. The Great Dark Spot in the southern atmosphere of Neptune was first discovered in 1989 by the Voyager 2 spacecraft. It was an incredibly large rotating storm system with winds of upto 1,500 miles per hour, the strongest winds recorded on any planet. How such powerful winds were discovered on a planet so far from the sun is still considered a mystery to this day. The Atmosphere contain 74% hydrogen, 25% helium and approximately 1% methane. Its atmosphere also contains icy clouds and the fastest winds in all Planet. FACT : According to the Indian Mythology God of Sea is called Varuna. Pluto was King or God of Underworld . Jupiter, Pluto and Neptune were three very powerful gods. They were also brothers.When their there Father Saturn died they divide the whole World equally, Jupiter took the sky, Neptune took the sea, and Pluto took the underworld. 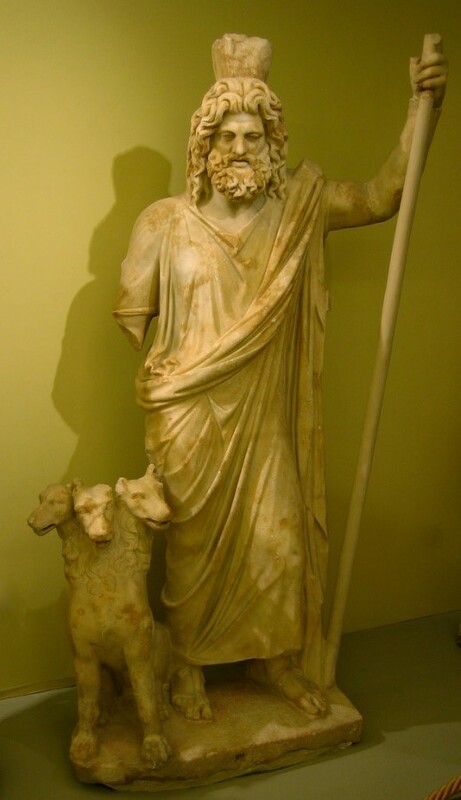 Hades, his Greek counterpart, was a darker god than Pluto, who eventually became known as the ruler of the afterlife and a fair judge of the dead. The Romans combined their deity of wealth – Dis Pater – with Pluto/Hades. The ninth planet in our solar system, now considered a dwarf planet, is named for the Roman god Pluto. The planet was discovered in 1930. The Lowell Observatory in Arizona had a contest to name the planet. Venetia Burney of Oxford, England, an 11-year-old girl, suggested the name Pluto to her grandfather, who passed it along to the institute. The astronomers unanimously selected the name. The moons of Pluto are also associated with the god. Charon is the name of the first discovered moon, after the boatman who ferried the souls of the dead to the underworld. The other moons were later named for Charon’s mother Nix, underworld guardians Hydra and Cerberus, and Styx, the river passage to the underworld. Pluto, large, distant member of the solar system that formerly was regarded as the outermost and smallest planet. It also was considered the most recently discovered planet, having been found in 1930. 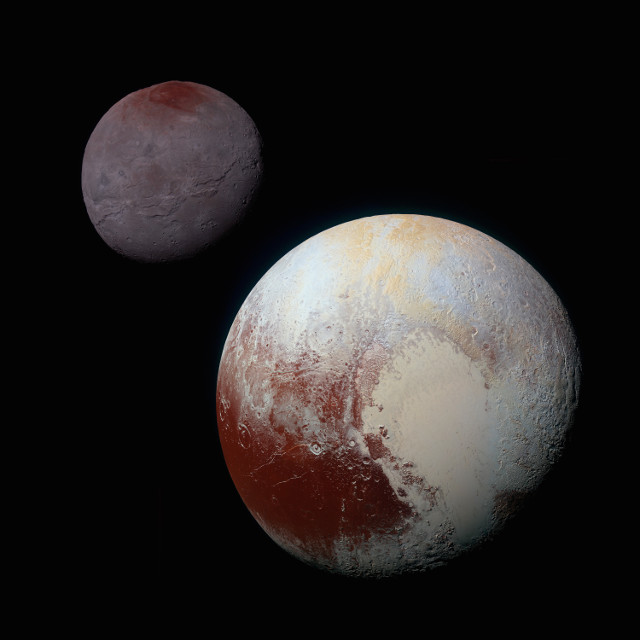 In August 2006 the International Astronomical Union (IAU), the organization charged by the scientific community with classifying astronomical objects, voted to remove Pluto from the list of planets and give it the new classification of dwarf planet. Pluto’s mean distance from the Sun, about 5.9 billion km (3.7 billion miles or 39.5 astronomical units), gives it an orbit larger than that of the outermost planet, Neptune. (One astronomical unit [AU] is the average distance from Earth to the Sun—about 150 million km [93 million miles].) Its orbit, compared with those of the planets, is atypical in several ways. It is more elongated, or eccentric, than any of the planetary orbits and more inclined (at 17.1°) to the ecliptic, the plane of Earth’s orbit, near which the orbits of most of the planets lie. In traveling its eccentric path around the Sun, Pluto varies in distance from 29.7 AU, at its closest point to the Sun (perihelion), to 49.5 AU, at its farthest point (aphelion). Because Neptune orbits in a nearly circular path at 30.1 AU, Pluto is for a small part of each revolution actually closer to the Sun than is Neptune. Pluto is not visible in the night sky to the unaided eye. Its largest moon, Charon, is close enough in size to Pluto that it has become common to refer to the two bodies as a double system. Pluto has been visited by the U.S. spacecraft New Horizons, which flew by Pluto-Charon in July 2015; many key questions about it and its environs can be answered only by close-up robotic observations.